Hide Files 3.4 free download. But typically, computer files and folders have not security protection so the best way to protect them is to make files or folders invisible for another's eyes. Hide Files makes hidden any files and folders (or whole Windows folder or even all computer disks). Hide Files allows you to select any folders (and sub folders with files) of your choice to protect as hidden files and folders. 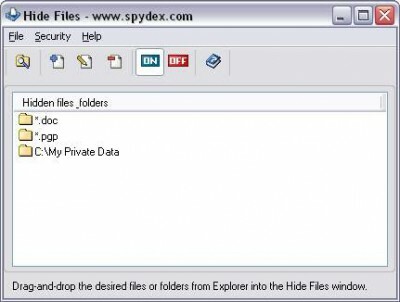 You can select any folders on your computer or drag-and-drop the desired folders from Windows Explorer into the Hide Files window. In one mouse click the folders selected become invisible. Once files or folders are hidden, it is impossible to find them, or access and remove any file. Unhiding files or folders is as easy as hiding them - just one mouse click and they are visible and accessible to you again. If program folder or whole disks are hidden, itself program or Windows will continue to work normally. You can use this security features to protect Hide Files from unauthorized start. - Any number of files and folders may be hidden at the same time. - Program does not modify file system structure. - NTFS, FAT32 and FAT file systems are supported. - Hotkey and password protection for program start. - Stealth Mode - program itself can be hidden. - Hide Files will hide any folders including Windows, Windows System folders and Windows partition root folders without damage of operational system itself (i.e. your computer will continue to work normally). - Invisibility of hidden files over network. - Locking of hidden files or folders to prevent access to them via list of most recently used files. Hide Those Folders is the best way for you to hide folders and hide files and keep sensitive and important data hidden from view. Hide My Folders is a useful software that allows you to hide files and folders from viewing, accessing and searching completely, so that only you know that those files or folders exist. Hide Folders is a security tool that will hide your folders out from any prying eyes. Hide My Files is a utility software that will hide your documents Hide My Files is an easy to use file security utility that protects files and folders from unauthorized use. FolderCloak is a useful tool that can hide your private folders easily. Advanced Hide Folders is a useful folder hider utility that will come in handy. PCMesh Hide Files and Folders is a revolutionary new software product that actually renders sensitive files invisible. A quick and easy way to protect sensitive information on your computer from children, employers, and anyone else who uses your computer, including hackers! Secure Folder Hider hides your sensitive files so that they can't be seen or accessed by other people.